So much has happened in Tusubira Village since last month, and we wanted to show you how much you’ve helped us to achieve these goals! The building, which had walls last time you saw, is now beginning to be roofed! This building will feature a Western style kitchen, essential for processing of food to go to market, as well as rooms for doctors and travelers to stay, and an area to provide safe, clean medical care for the women, men and children. We have so many dreams for this building; a clean, indoor space can change an entire community, and your support in building it has been so appreciated. The biggest thing right now is to finish this first building at Tusubira Village. We need to put in electricity and plumbing, windows and walls, as well as furnish it. As soon as that is completed we can begin using the building for all of the things we plan to offer to this community - from family planning to skills training to having a social worker on site full-time. If you’re interested in supporting the building projects at Tusubira Village, be sure to check out the GoFundMe, which is still up and running! Your contribution will help change lives. The gardens have been a source of financial growth as well as educational wealth for the entire community. These past few weeks, school children have been touring the gardens to learn about healthy eating and growing produce. These rows of maize, beans, peppers, bananas, mangos, and much more are being sold at the markets in order to raise the money to expand the gardens. These gardens will allow the community to become self-sustaining, and teaching school children how to take care of them is a vital part of building strength at Tusubira Village. As we’re headed into the dry season, community members are learning how to mulch the gardens and cover the soil with banana leaves. This step prevents crop loss by keeping moisture at the roots of the plants. This is just one of the wonderful skills that are being developed! 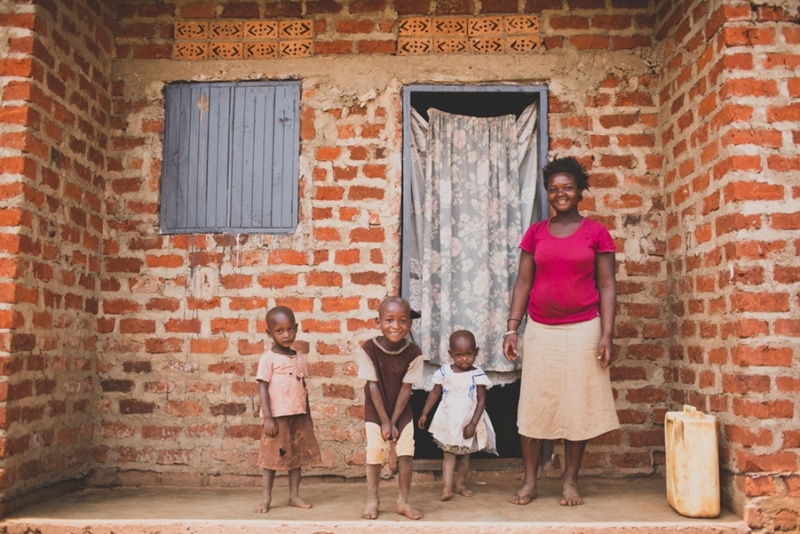 The biggest reason why this project was created is the wonderful people whom we’ve gotten to work with in Uganda. These people, whose lives are directly touched by all the work you’ve helped us to accomplish, wanted to share with you what these changes meant to them. While Grow Hope helps to provide funds for growth, the primary goals are to provide opportunities for education and skill acquisition, which will help community members reach their goals of becoming self-sustaining and strong, through betterment of sanitation, school attendance, nutrition, empowerment of women, and many other aspects along the way. We also wanted to say a big thank you to all who participated in the April art auction and the Tiggy & Grace shop opening earlier this month. Thanks to generous artists who donated their pieces, 100% of the proceeds are able to go to Tusubira Village. The auction alone raised almost $2000, the proceeds of which helped to start raising the roof on the first building! The community has so many goals and projects they want to get started on. Next up are finishing the building, expanding the gardens, and getting the Porridge Project off to a good start! The Porridge Project is a new program that will help prevent malnutrition in the area by creating the means for villagers to grow, mill, and package their own nutritional instant porridge. This porridge will not only provide school children a breakfast before a long day at school, but will provide jobs for residents, and profits through sales outside of the community. Thank you for all that you do for the community at Tusubira Village, and thank you for allowing us to share our joys and successes with you!